At Senior Citizen Services, caring is not an obligation, but a passion! Since 2011, SCS has played a huge part in helping elderly people to remain living independently in their own homes. Their services are increasingly in demand, especially as government cuts have meant that senior citizens are discovering that it is becoming more and more difficult to find a trustworthy handyman at a reasonable cost. 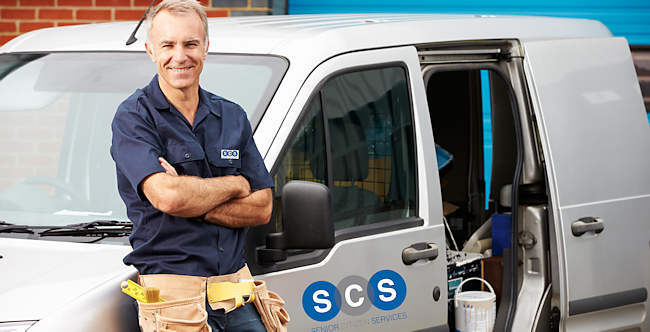 SCS is a fantastic way to provide property maintenance services to your local community, backed by the reassurance of a reliable and professional brand name. With affordable setup costs (£6,995 maximum, dependent on area) and excellent earning potential, franchisees operate within their own, exclusive territories and enjoy monthly franchise fees of only £25.00 per month. As an SCS franchisee, you are involved in every aspect of the business, including accounts and administration, handling enquiries, planning the workload and resolving any day-to-day issues that may occur. The SCS head office team is always available for ongoing support and can assist you with every aspect of starting your own business. In addition to this, SCS handles all of your marketing and advertising, helping you to build your profile in your local area right from the start. As they appreciate that franchisees may have a specific skill or preferred field, they ensure that any advertising is tailored accordingly. They also provide you with ongoing leads, vehicle advertising, uniforms, stationery, leaflets and various advertising materials, all of which are included in the cost of the franchise! SCS is actively looking for more franchisees to add to its network. If you have a specific skill or expertise in the property maintenance field, SCS could be the ideal opportunity for you. To find out more about Senior Citizen Services, why not get in touch on 0800 246 5425 or click here to visit their website to read about this great franchise opportunity.